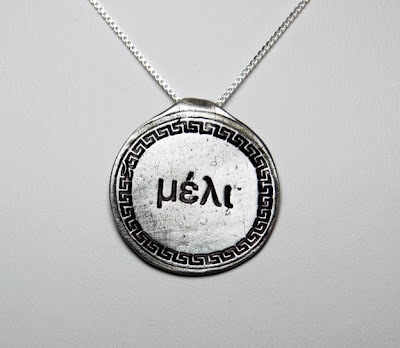 A special request from Pam for a necklace with a name in Greek - one that didn't "look new." Happy to accommodate. 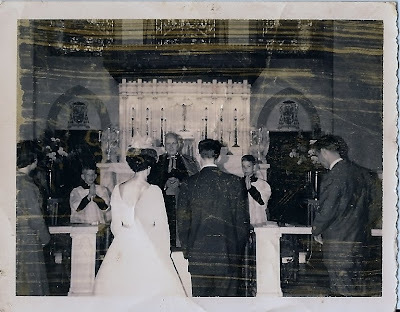 47 years ago today my parents were married. This is a photo of them at the alter exchanging vows, but the photos from the hotel before the wedding are the ones that I cherish more than all others - those pictures tell the story for me. The nerves, the inexperience, the young, young people they were. I love this photo and this is the one I share with you. Dad, I'm not sure that you would have enjoyed the technological revolutions of blogging, tweeting, texting and the rest (complete with family revelations, inappropriate comments and personal stories) but I'd like to think that someone is reading blogs in heaven. Happy 47th Mom. I love you. 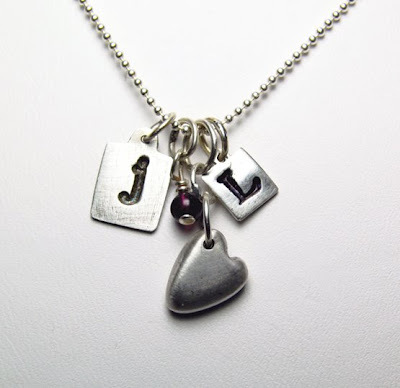 A special order of a special necklace for a special couple. The engagement necklace is now available on my Etsy site. This one gets unwrapped tomorrow. 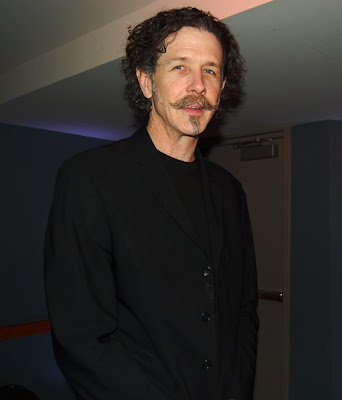 I spent a lovely evening in Boston with Tom to celebrate his birthday. A visit to the new Mandarin Oriental "M" Bar, a quick stop at the Four Seasons' Bar at Aujourd'hui and then the stop that made the evening truly special - a three cheese pizza at Upper Crust on Charles Street. Tom is smiling because I said "DON'T MOVE - it's Jacques Cousteau!" and snapped the picture. He'll hate me for it later. I don't care - I LOVE it! Happy Birthday Tommy. I've been trying to organize my photo files over the last few weeks and I came across some Moda di Magno files from a few years ago. I may revive a few of these as I find I really like them still. TBD. 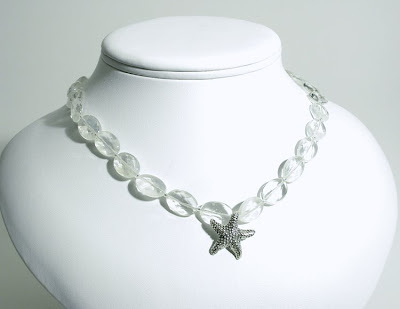 Faceted Lemon Quartz with Sterling Silver starfish. 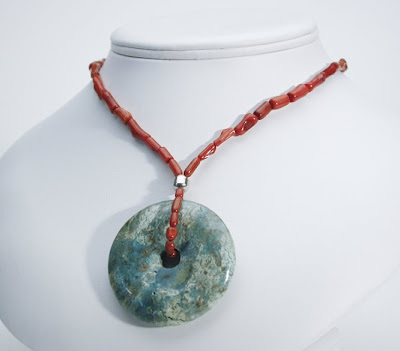 Red Branch Coral with Turquoise donut pendant. Blue Agate three-strand necklace. I'm definitely going to revive this as I recently came across a small stash of these stones. 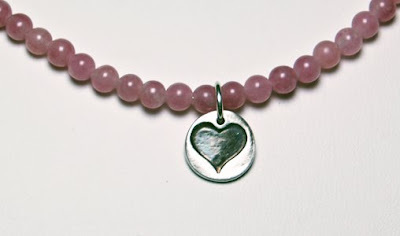 Raspberry Quartz, Raspberry Jade and Purple Jade. Yummy. 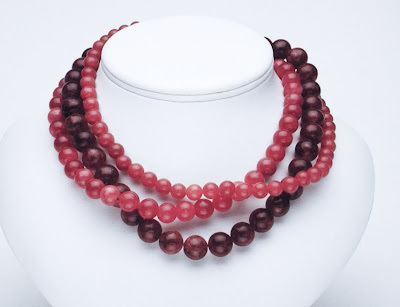 Four tones of Raspberry Jade. Yummier still. 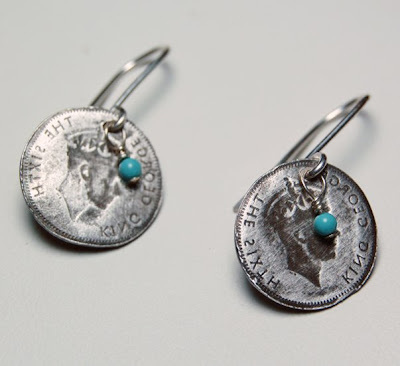 King George earrings with Turquoise drops. These are mine. 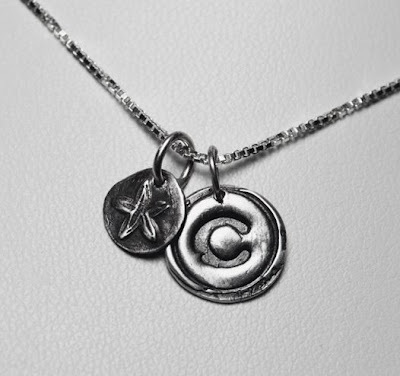 Caroline's pendant with a sand dollar. 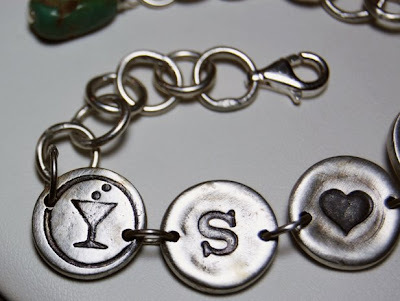 Made for Valentine's Day - but the USPS, you did not deliver for me and it has not arrived yet. How could you? Once you've registered for Blogger Social '09 (Boston Edition!) get yourself to one of three SPECTACULAR hotels offering Blogger Socialites awesome deals. The Omni Parker House is one of Boston's grand hotels located on the edge of the financial district, steps to Boston Common, City Hall, the State House, Historic Faneuil Hall, the North End and waterfront. The Parker House is one of the five oldest continuously operated hotels in the United States. Completely renovated in 2007-2008, it is now one of the newest continuously operated hotels in the US. The hotel has taken great pains to increase the "green" quotient in the hotel while maintaining an extraordinary level of history and detail. Visit Parker's Restaurant where John F. Kennedy asked Jacqueline Bouvier to marry him. 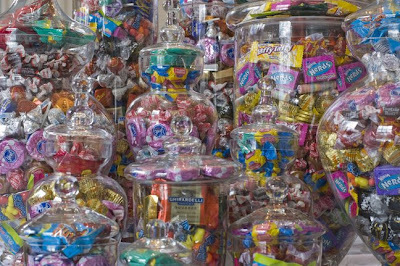 Have a piece of the renowned Boston Creme Pie or sip a cocktail at The Last Hurrah - the haunt of many a politician past and present. The Taj Boston, located at the corner of Arlington and Newbury Streets is formerly known as "the Old Ritz." Bought by the Taj company and renovated in 2007, the Taj has maintained the old elegance of a Boston tradition and infused this fabulous 1927 gem of a hotel with continental vibrance that can be felt from the rooftop event space to the grand ballroom and down to the cozy and utterly charming bar simply known as The Bar. With spectacular views of the Boston Public Garden, the Commonwealth Avenue pedestrian Mall and placed right at the start of the superlative shopping and dining spots on Newbury Street, the Taj has something for everyone. All this and pet friendly - nice! The Charles Hotel is the jewel of Harvard Square. A modern and bright hotel with a staff dedicated to flawless service. A hotel that made a green commitment several years ago, thoughtful attention to detail is noticeable at every turn. 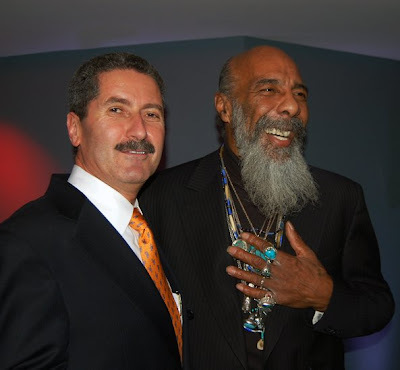 Home to the world famous Regatta Bar Jazz Club, the hotel has played host to the preeminent musicians from all over the world. A favorite spot for celebrities, academics and politicos, you never know who you might spot at Henrietta's Table, Jody Adams' Rialto or the darkly delicious Noir Bar. Smack in the middle of Harvard Square shopping, clubs and shops - and a short hop to the Back Bay, Prudential Shops and even more restaurants! 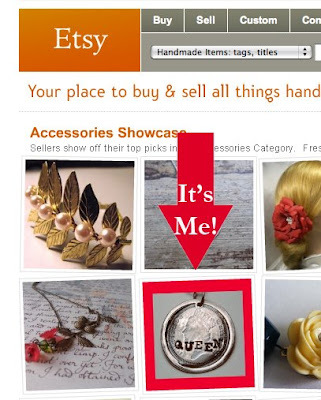 Anyone bloggy or Tweety peeps who decide they are woefully underaccessorized (or up against the V-Day deadline) and sends a note (via Twitter, or comment below, or comment during checkout) will receive free earrings in addition to free shipping on any purchase made today. Go get your accessory on! 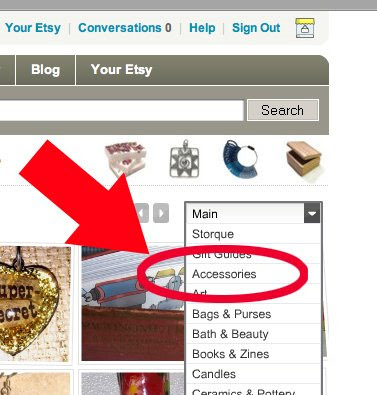 User interaction not being Etsy's strong suit, you'll have to navigate to the right side of the main showcase and use the drop down to get to the accessory showcase. I promise to make it worth your while. Blogger Social 2009 is happening in Boston! We are planning a dazzling array of fabulous places to gather, meet, talk, tweet, enjoy refreshing beverages and give you a flavor of this amazing city. Want to be a part of the historic second Blogger Social? Then REGISTER HERE and get ready to hang with the swells and and giant minds of the blogging universe. We've been gifted with great rates at three of the City's nicest hotels (who are welcoming Blogger Socialites with open arms) and are promising as much fun at BS08. More info to follow - but shout out with questions!!! Chopped! From My Television Lineup! So a "chef" can drop a piece of raw meat on the studio kitchen floor, throw it in the pan, serve it to the judges and not be eliminated based on sheer negligence? Hmmm, where would Peanut Corporation of America get the balls to put out tainted peanut butter? Bad food safety should never be tolerated - ever, especially when being judged by a a purportedly "expert" panel. 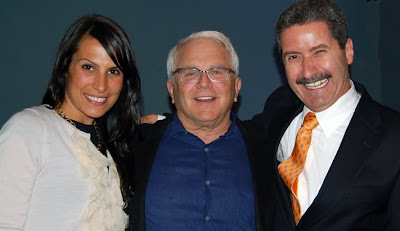 Chopped has been chopped from my television lineup. You might have had a contender against Top Chef (Ted Allen being far less annoying that Padma) but the kind of gross, um, grossiness I witness on the Yucca, Watermelon, Tortilla episode went way beyond the pale. Way. Happy Birthday Kim! It was a totally fabulous evening and you looked divine. I hope this year is the best one yet! 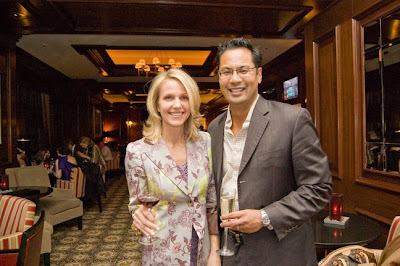 I was a guest at the Charles Hotel's kick-off of the Regatta Bar Jazz Festival. Richie Havens (ably supported by the amazing Walter Parks) played a set that had the crowd alternately clapping, singing along and standing on their feet. One of the best nights of music I have EVER enjoyed in my life. Even better, I met a bunch of awesomely cool people and reconnected with old friends. All that on a Thursday? That ROCKS. Special thanks to Grey Goose for the orange vodka sidecars and Boston Magazine for co-sponsoring the event. Just in time for Valentine's day, a limited edition pendant (numbered 1-20) created for the American Red Cross, Boston Chapter. The fine people who ensure a blood supply for when your idiot relatives are involved in near-death motorcycle accidents. (Or is that only me?) I digress - the American Red Cross does a great deal to help where others (heck of a job Brownie) fail. The necklaces are available for $45 and 50% of your purchase price benefits the Boston Chapter, the other 50% supports your local artisan (me.) I think it was an awesome idea for the Boston Chapter to invite artists to create for a cause. 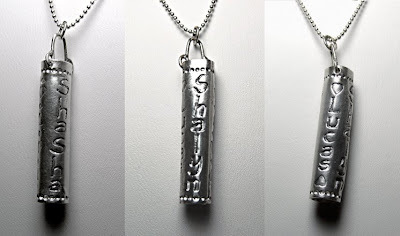 The pendants numbered 1-20 and signed with the "M" on the back. Um, while I have written about crotchless jeans, they weren't the kind you buy - just the kind you complain about. Honorable mention to Monsters Inc. part whatever, and Will Ferrell's Land of the Lost movies. "Hated It" Awards to: E*Trade baby spots (again,) All Budweiser spots were boring, Pepsi MaGruber was appalling, H&R Block Death and Taxes had the worst sound of any spot in the 20th century, Cars.com so close and yet, not. Gatorade G campaign -FAIL. GoDaddy should be shot - I would change my webhost if they weren't so cheap. But the ads sucked. Vizio, um, put that account in review. Thus concludes another Super Bowl.